Minuscule and not known to many, imps are a cousin of the faerie, green-skinned and silver-haired. They may be found with either insectoid or draconic, webbed wings, and have small horns atop their heads. They live in forests, where they may pull pranks on unwary travelers at will. Average Lifespan:: Immortal; but prone to accidental death. Thus, average lifespan is around 100 years. Average Weight:: A few ounces. Location Found:: Abroad; mostly in forests or jungles, places where there are tall trees and thick vegetation. Relations The imp an the faerie are closely related; ages past, they were part of the same species. However, before the faerie embraced their summoning powers and fused with the animal spirits, there was a terrible war in which two clans fought over a bloodfued as old as time itself, resulting in the little imps' exile into the forests of Heartwood. To his day, an imp will attack any faerie on sight, and the opposite likewise. Species info credited to Aehryn and Blazeh/Verridith. Appearance Imps are tiny creatures, the largest ones reaching the size of a human's hand. Their faces are elfin; high cheekbones, large, slanted eyes, and pointed ears. Their skin is usually a pastel shade of green, and their hair is white or silver, very rarely black. Large, semi-transparent wings with green webbing protrude from their backs, and two small horns rise from the top of their head. They like to dress in loose tunics with holes slit in the back for their wings, usually in shades of green or brown. Culture Imps are extremely mischievous, often lying in wait for travelers in the forest, and tormenting them by swooping down on their heads or weaving illusions that make them think they are lost. But at heart, they do not have bad intentions, and their pranks rarely go beyond playful games. They have also been known to help elves who pass through their forests, for imps and elves share a deep bond. Though usually kind enough and carefree, you should never make an imp angry; they can be wrathful little creatures, and formidable enemies for their size. Abilities Imps are very gifted in magic, especially in illusions. Their tiny blowdarts and spears, though they don't look like much, are also to be feared; they create weapons that can stun a human with the lightest touch. They don't often fight in wars, but they are as intelligent as elves and remarkable strategists. Another ability of the imp, though rare, is a strange summoning magic; older imps, hundreds of years old, having studied ancient elven texts on such, may bring the spirits of the dead to life once more as shimmering silver creatures, most often smaller animals such as cats or birds. Strong-willed imps may bring about bears or even the souls of dragons or wolves. However, there is a risk that these summonings may turn on the summoner, slaying them in the most brutal way. One day, as Death wandered the Realm unseen, he happened upon an elf walking down a road, and cursing. As Death observed from a distance, delighting in the elf’s misfortune and wondering what had caused it, the elf sat upon the ground, took off his boot, and dumped a small pebble upon the road before continuing on. A mere pebble? What harm could a mere pebble do, to cause such torment? he wondered as he gazed at the offending speck of stone, and deftly seized it with the tips of his claws. After a moment, he resumed his travels, still clutching the pebble, but this time, he paid close attention to the mortals scattered upon the Realm. Here and there he found them cursing some mishap or another. A pebble in a shoe, a stubbed toe, pricked fingers, a speck of dirt in an eye, insect bites and stings, all manner of small annoyances. Death grinned to himself, and withdrew, taking the pebble with him. Once he had reached a remote spot, he took clay from the ground, and fashioned a tiny figure, small enough to fit in a human hand. He took the pebble, and fashioned it into a heart. Then, with one great claw he drew a single small drop of blood from his own flesh, and let it drip upon the tiny figure. Clay became flesh, the stone heart filled with malice, and thus the first imp was made. You will be my gift unto the Realm and its people. May you ever be a pebble in a shoe, a thorn in their flesh, a constant torment they will never be free of, he intoned before releasing the imp into the Realm to unleash small torments upon the people of the Realm. As time passed, he made more imps to join the first, until there were too many to ever be eradicated despite their small size and tendency to get into more trouble than they could handle. As the imps spread, and caused no end of problems, Death watched, and was pleased. Name: Diraydnili. Location: sleeps in a petrified tree in Felnova's Song Forest. Status: Alive. 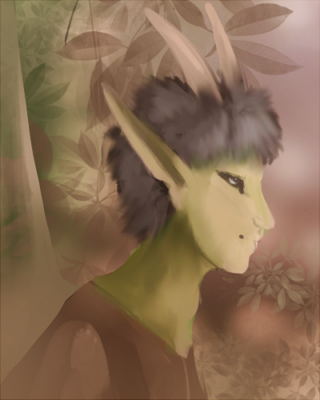 This Ancient First is an imp with pale green skin, long tapered ears, and small, black horns. He has bright blue eyes and very long white hair tied in places with thick bands, handing uncut so long that it trails upon the ground when he walks. His most striking feature, however, are his six translucent wings - wings that appear to be a mixture of batlike and insectoid, painted in colors of tans and creamy whites. 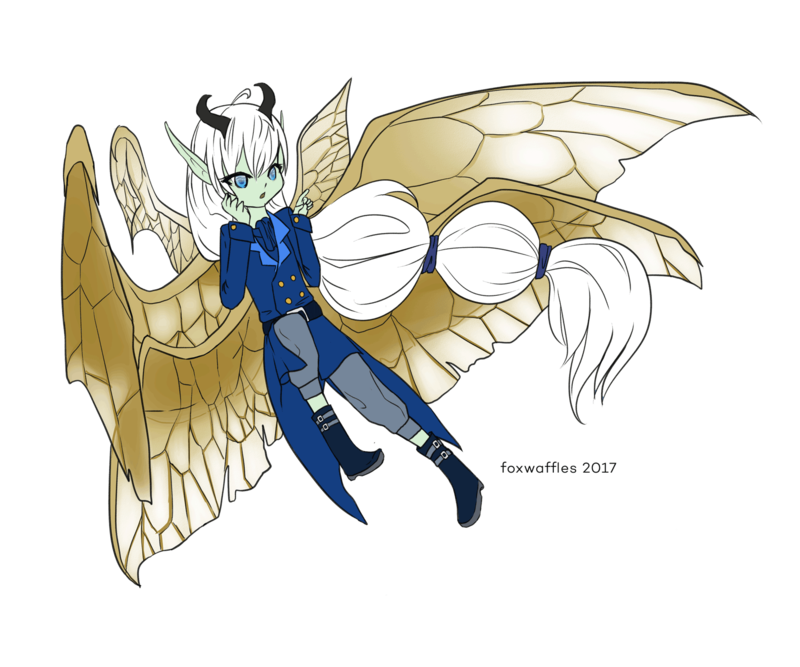 Proud as an imp can be, Diraydnili enjoys wearing fine clothing in blues, greens, whites, browns and silvers - sometimes a mix of all of the above. He crafts his own tiny clothing, though does not often accent it with jewelry, save for the odd earring and ring on occasion. When he wants to, he can cover himself completely with his wings, which he does often if some mischief or another tears, stains, or otherwise ruins whatever garb he had chosen to wear. The First Imp is proud and arrogant, and exceedingly mischievous, often to the point of putting his own life in danger. He is very quick, and cunning, and has - thusfar - been able to evade death, though he has been injured several times (usually by being stepped on or knocked into). Classification: vexing type of imp. Location: generally found in sky-continents. Enemies of all things that fly, the gremlin is a type of wingless imp that envies those that may touch the clouds. Small, with large ears, thin noses and long, pointed fingers, they resemble most a humanoid bat without the wings. Their tails are long and ratlike, tipped with a non-venomous barb, and their hides may come in a variety of browns, greys, blues and even purples. They love to decorate themselves in feathers and other bright objects, and enjoy stealing bits of fabric and jewelry to further enhance their less-than-appealing looks. Because of their envious nature, gremlins often steals from those with wings. They take the buckles off of dragonsaddles, steal feathers and jewelry from avians, and soil the prey of gryphons and roc'a. The dragons of Stroen'na, being less peaceable than the avians they live beside, hate them entirely and have vowed to hunt any and all that may come across their path.